«Social HR» is a confusing term. It seems that every social HR expert uses it differently – for some it's all about the company’s Twitter/Facebook policies, others talk about using LinkedIn to recruit top talent and the rest talk about a private social network used internally. To make things simple, social HR tools should be divided into external (Twitter, LinkedIn, HootSuite, etc) and internal ones, which fall under the Social HR software category. Because Social HR software as a category is still rather broad, let's look at social HR tools one by one. Social intranet and enterprise social networking are frequently used interchangeably, but technically that is not correct, because some vendors (like Bitrix24) have a social intranet and ESN combined into a single solution, while others, like Microsoft, require that you install both SharePoint (intranet) and Yammer (enterprise social network), if you want to have social intranet in your company. The distinction between social intranet and ESN is simple – social intranet is about work, because it simply wraps intranet tools into a social interface, while enterprise social network is about internal communications – replacing email, at least to some extent, with a private social network. So while social intranet by definition can always be used as an enterprise social network, ESN (unless it has intranet already built in) does not typically have all the necessary intranet functions. 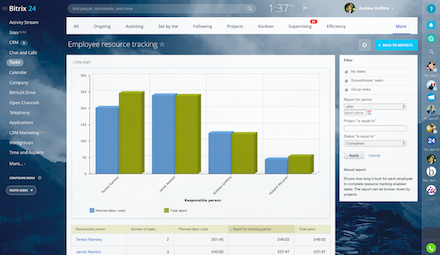 An Activity Stream is a unified, interactive update feed where all the changes and new additions to the intranet are listed. These include company announcements, new posts, polls, comments and replies. 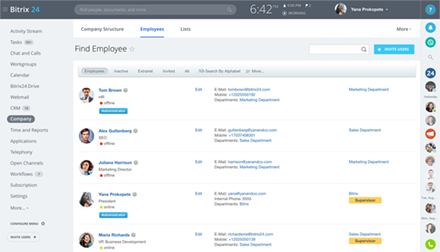 Unlike a traditional intranet, a social intranet activity stream is personalized, so while everyone receives important companywide news and announcements, each employee sees activities only relevant to him or her. This prevents information overload. Workgroups and user groups unite employees who work in the same department (i.e. HR or Sales), collaborate on a project (i.e. Cost Cutting Committee) or share the same interests (i.e. Humor or Ride Sharing). User groups in a social intranet serve several functions – they keep information relevant to the recipients, limit access to pertinent users, and assist in self-organizing. 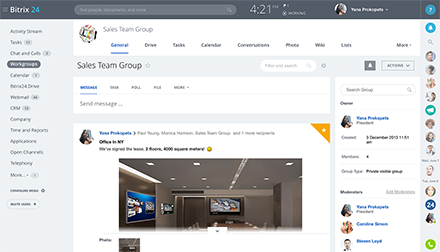 Unlike traditional intranets, social intranets offer multiple ways for employees to communicate with each other and the company. 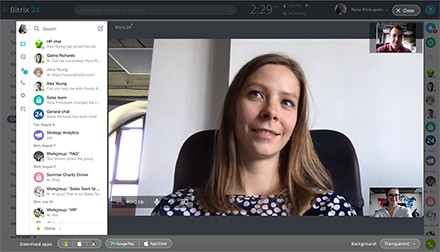 Typically these include companywide announcements, conversations (posts that others can and are encouraged to comment on), instant messages (chat and group chat) and videoconferencing. A social intranet typically includes an employee directory, company photo gallery, employee manuals, HR and service request forms, and other resources. In order to find a needed person or file, a search box is available on all pages. As stated above, a social intranet is about work and not mindless chatter, so its interface is designed to provide access to tools that are used on a daily basis. Typically these include things like document and project management. 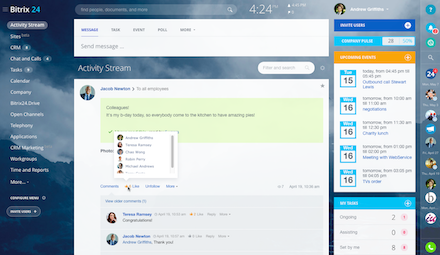 Some social intranets, like Bitrix24, also come with CRM. Workflows (like document approval, records management or lead assignment) are frequently built into social intranets, too. These will be covered in great detail in future posts.